Is your business connecting with its clients and prospects through the channels they prefer most? Smartphone sales have exploded. In January of 2012, Google announced it is activating over 700,000 new smartphones per day. That’s right, PER DAY! Apple announced in the 4th quarter of 2011 it sold over 11.8 million iPhones. Analyst from Morgan Stanley predict based on current patterns that mobile internet use will increase by 4000% by 2014. Smartphones are here to stay and they are changing the way we communicate. In the world of business communications, it’s important to understand the channels your clients are utilizing to access information. The internet itself brought about a huge shift in the way we stay informed and keep in touch. The world-wide web, email and social networking have changed the landscape for connecting with others. Mobile internet access is currently the fastest growing segment in this paradigm shift. In 2012, internet use on mobile devices is on track to equal that of desktop internet access. The question is… Is your company taking advantage of the opportunity presented by the mobile platform? The problem with this massive shift to mobile surfing is that most websites are not designed for the small screen. Many websites of today are built with desktop users in mind. This means they present a less-than-optimal experience when they are accessed through a smartphone. Small links make it hard to select what you want. Pages with too much information and too many pictures slow down the speed in which they load and require a lot of zooming in or out to be able to read the content appropriately. Mobile websites take into account the strengths and weaknesses of the platform. They have easy-to-use links designed for touchscreens and only provide the relevant information and features a person would want when visiting from a smartphone. 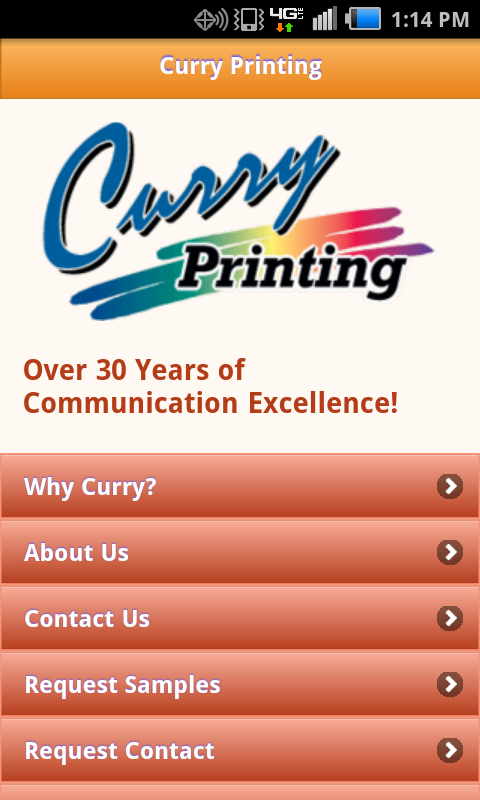 For example, Curry’s mobile website doesn’t include a “send a file” feature like our desktop version. Our clients are not looking to send us files from their phone so this feature is irrelevant and just takes up valuable screen space. With the rapid adoption of mobile devices, it’s time your business presents itself in the most optimal way to your mobile audience. This will allow you to cater to your clients’ and prospects’ needs and provide better opportunities to win more business. This is so true! So do you guys create mobile websites at Curry? Hi sadlier1. Thanks for the feedback! Yes, we do. We help clients leverage all those smart phones being used out there to help them build their business. There are a lot great opportunities our mobile technology platform can provide including ways to help companies make their print interactive and more effective. Exciting times! !